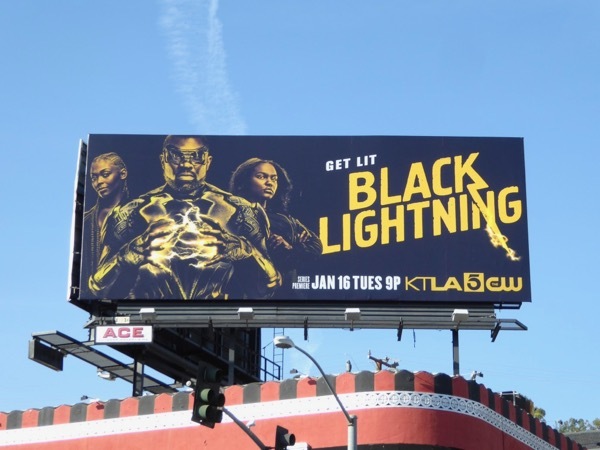 Before Marvel's Black Panther hits the big screen another black superhero is making his debut on television in his own solo series, Black Lightning. 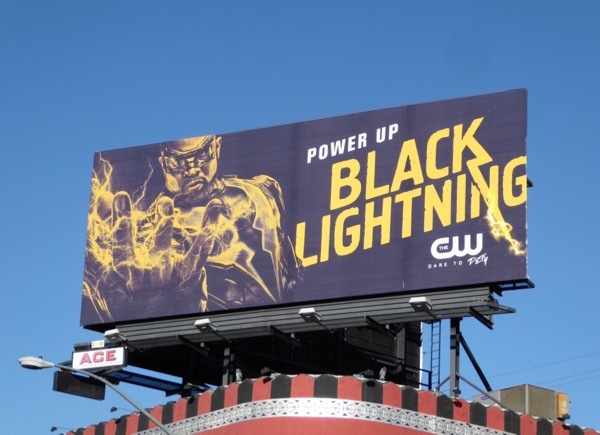 Joining The CW's pantheon of DC comic book heroes is Cress Williams as the electricity-powered metahuman created by writer Tony Isabella and artist Trevor Von Eeden in 1977. 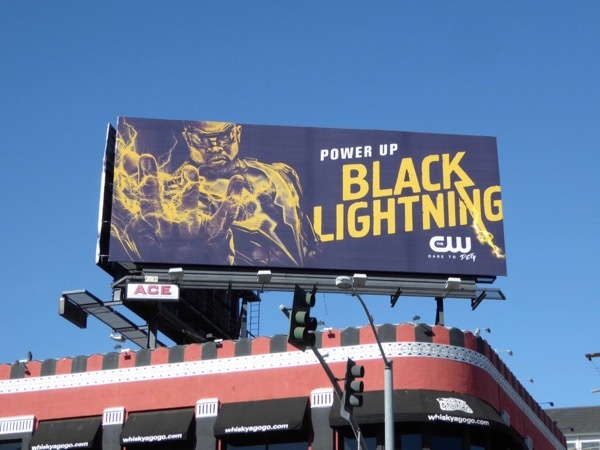 The difference with this series from the others is that when we meet charter school principal 'Jefferson Pierce' he has retired from crime-fighting nine years ago and is drawn back into the world of capes to protect his family. 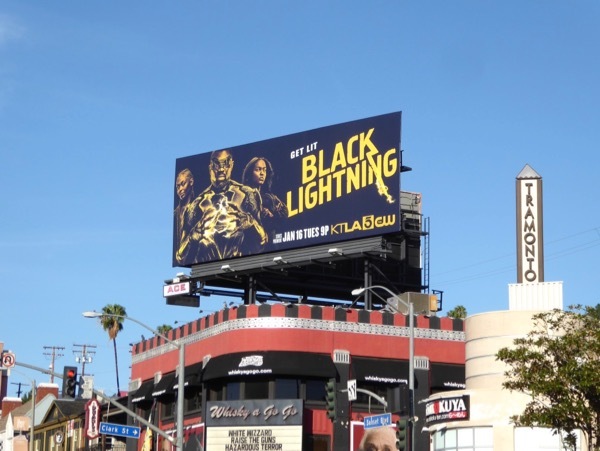 Pitched as more grown up show, he'll actually look at real-life problems in his neighbourhood like drugs, corruption, gun violence and police brutality, especially when his daughters 'Anissa' and 'Jennifer' (played by Nafessa Williams and China Anne McClain) are threatened by a local street gang, The One Hundred. 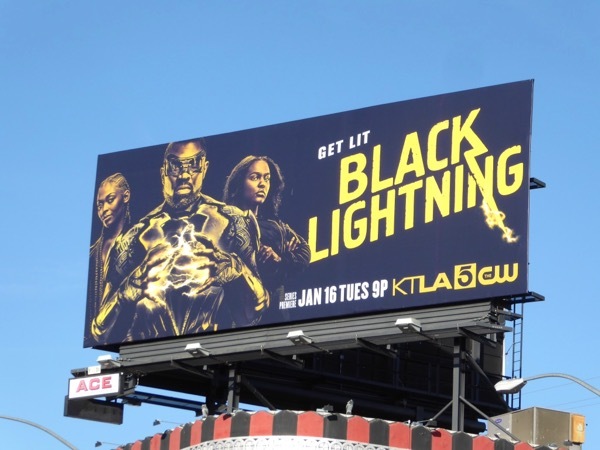 It looks like this may be a family crime-fighting affair as Anissa inherited her vigilante father's superpowers and will eventually suit up as the hero, 'Thunder', to bring justice to the city streets. 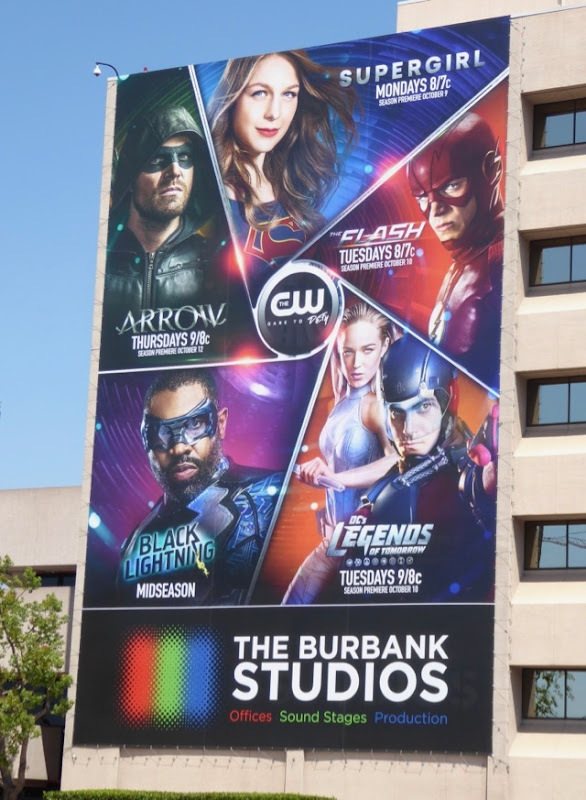 The 'Power Up' teaser billboard for the new superhero series was snapped above the Sunset Strip on November 30, whilst the group billboard for The CW's DC superhero shows was snapped in Burbank on August 20, 2017. 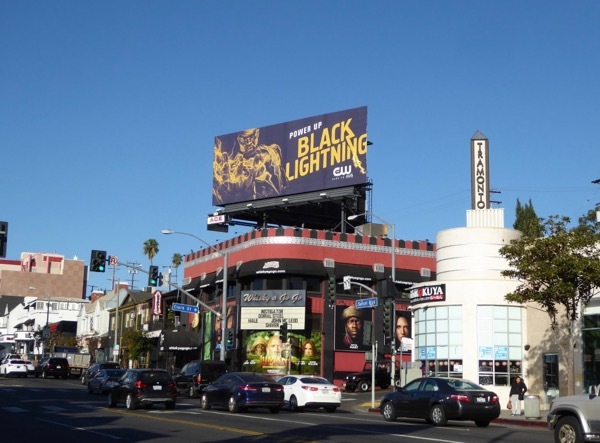 Meanwhile the 'Get Lit' version also featuring his daughters was spotted in the same ad location above Whisky A Go-Go on January 5, 2018. 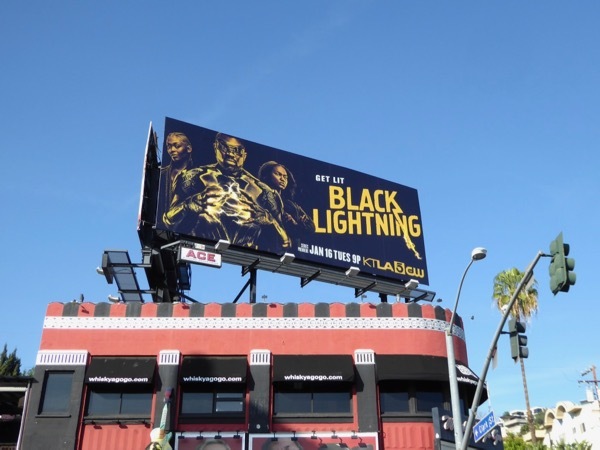 For more black superheroes in action, make sure you check out these Storm billboards for X-Men: Apocalypse, these Luke Cage and The Defenders billboards, plus Falcon, War Machine and Black Panther in these Captain America: Civil War billboards. 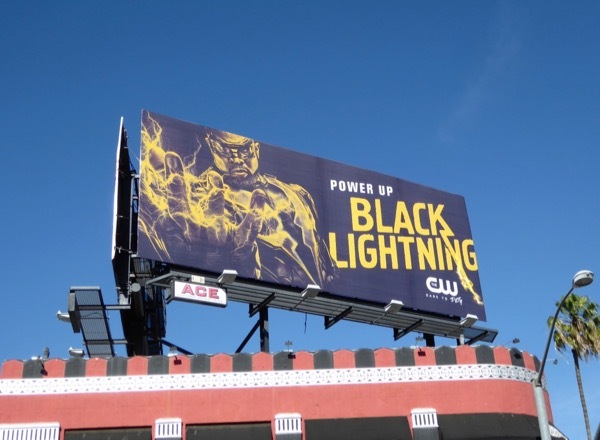 Only time and ratings will tell whether lightning can strike for the fifth time for The CW this winter TV season as Black Lightning follows in the footsteps of Arrow, The Flash, Supergirl and DC's Legends of Tomorrow.